A lot of children have enlarged tonsils or adenoids. This can make their airways narrower, causing them to snore and stop breathing for short periods of time while sleeping. If their sleep is affected over the long term, it can lead to various problems and sometimes even to medical conditions. Because of this, doctors often recommend surgery to remove the extra tissue. Some children have enlarged palatine tonsils (often simply referred to as "tonsils," on the left and right sides at the back of the throat), and others have enlarged adenoids (also called the pharyngeal tonsil, found at the back of the nose). The medical terms for these enlarged areas of tissue are "tonsil hypertrophy" and "adenoid hypertrophy." Sometimes both are enlarged. Adenoids are not to be confused with nasal polyps. These are benign growths in the membranes lining the nose. They usually only grow in adults. It is also important not to confuse enlarged tonsils with tonsillitis (an inflammation of the tonsils). These are two different medical conditions. The main symptoms will depend on things like whether it’s the palatine tonsils or the adenoids that are enlarged. For instance, enlarged adenoids mainly affect your ability to breathe through your nose. Pauses in breathing during sleep, on the other hand, are mainly caused by enlarged palatine tonsils. If children don’t get a good night’s sleep, they don’t feel rested during the day. Rather than appearing to be tired, they then tend to be fidgety or “wired.” But they may suddenly be overcome with tiredness, for instance during car journeys. Extreme tiredness only becomes more obvious in older children and teenagers. If children often have pauses in breathing and wake up frequently at night, they may develop obstructive sleep apnea (OSA). They then have hardly any deep sleep, which are the “restful sleep” phases. It is not clear why some children have enlarged tonsils or adenoids, and others don't. But these enlarged areas of tissue are often a normal part of growing up. They sometimes get smaller again over time. And the severity of symptoms isn’t always related to the size of the affected tonsils or adenoids. Enlarged adenoids or tonsils don’t cause any problems in many children. About 7% of all children snore all the time, and about 2% have nighttime breathing pauses and obstructive sleep apnea. These problems are often caused by enlarged tonsils or adenoids in children, particularly between the ages of 3 and 6 years. Respiratory tract infections such as common colds: Constantly breathing through your mouth due to enlarged adenoids increases the likelihood of these infections. Middle ear infections and glue ear: These develop if enlarged adenoids prevent the flow of air to and from the middle ear. Chronic glue ear can lead to hearing and speech problems. Jaw misalignment, open bite and altered position of the tongue: These can also occur as a result of breathing through your mouth all the time. Severe, long-term sleep apnea due to enlarged palatine tonsils can affect a child’s physical development and increase the risk of cardiovascular disease (heart and blood vessel problems). The consequences of enlarged adenoids or tonsils will mainly depend on how narrow the child's airways have become, whether they have breathing pauses during sleep, and how long they have had these problems. Sometimes the symptoms go away again after a while. Sleep apnea is more likely to lead to other medical problems than snoring is. But snoring loudly and regularly breathing through your mouth can have consequences too. Snoring quietly every now and then – for instance, due to a cold – is harmless, though. When children have the above-mentioned symptoms, their parents often first seek advice from their family doctor or pediatrician. They will then usually be referred to an ENT (ear, nose and throat) doctor for further diagnostic tests. The doctor first asks about the symptoms. He or she then looks at the child’s throat to see how big their tonsils are and how narrow their airways have become as a result. The child’s ears are examined too, for instance to see whether they have glue ear. Their hearing and speech is tested as well. It is also important to rule out other possible causes of the symptoms, such as allergies or a jaw misalignment. In rare cases, doctors recommend going to a sleep laboratory. This can be a good idea if it is thought that a child has obstructive sleep apnea, if the child is very young or if other diseases or disabilities may play a role. Obstructive sleep apnea can only be diagnosed with certainty in a sleep laboratory. But this step is often not taken in people with enlarged adenoids or tonsils because it involves a lot of time and effort, and there are only limited appointments. What’s more, children often find it hard to do what they are meant to do in sleep laboratories. It isn’t always easy to determine the point at which enlarged tonsils or adenoids become a health problem. For instance, how "bad” does snoring have to be to warrant having surgery? Different doctors may give different advice. One thing they generally agree on, though, is that long-term sleep apnea has negative effects on the child and should be treated. If the child only snores every now and then, only snores quietly or usually only when they have a cold, there is no need for treatment. Wait and see how the symptoms develop over time: This approach makes sense if the symptoms are mild and could go away on their own. Parents should then observe whether the snoring gets worse and their child stops breathing for a few seconds in their sleep. It is also important for the child to have regular check-ups with an ENT (ear, nose and throat) doctor. Steroid nasal (nose) spray: This type of spray can be used to shrink the adenoids, making it easier to breathe through the nose. It doesn't help in people who have enlarged palatine tonsils. Surgery to remove most of the adenoid tissue (adenoidectomy). Tonsil surgery: In most cases, only part of the palatine tonsil tissue is removed (partial tonsillectomy or tonsillotomy), and in rare cases all of it is removed (total tonsillectomy). 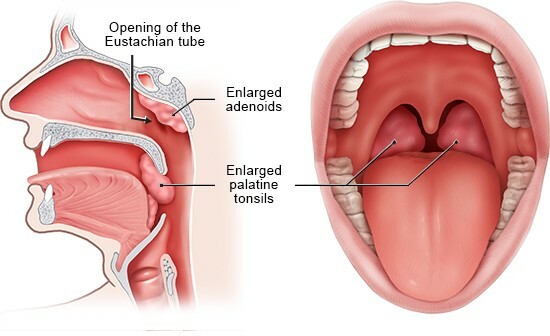 If both the adenoids and the tonsils are enlarged, they can be (partially) removed in one operation. If a child has persistent glue ear, doctors often recommend that they have grommets implanted during the operation too. These narrow tubes improve the exchange of air between the middle and outer ear. Our decision aid may help when deciding whether or not to have surgery for enlarged palatine tonsils. It summarizes the main advantages and disadvantages of the various treatment options. Deutsche Gesellschaft für Schlafforschung und Schlafmedizin (DGSM). S3-Leitlinie: Nicht erholsamer Schlaf/Schlafstörungen - Schlafbezogene Atmungsstörungen. 2009. Kaditis AG, Alonso Alvarez ML, Boudewyns A, Alexopoulos EI, Ersu R, Joosten K et al. Obstructive sleep disordered breathing in 2- to 18-year-old children: diagnosis and management. Eur Respir J 2016; 47(1): 69-94. Pabla L, Duffin J, Flood L, Blackmore K. Paediatric obstructive sleep apnoea: is our operative management evidence-based? J Laryngol Otol 2018; 132(4): 293-298. Powell S, Kubba H, O'Brien C, Tremlett M. Paediatric obstructive sleep apnoea. Clin Otolaryngol 2010; 35(5): 418-423. Urschitz MS, Poets CF, Stuck BA, Wiater A. Schnarchen bei Kindern. Algorithmus zum diagnostischen Vorgehen. HNO 2014; 62(8): 586-589.